Passivation is a critical part of our quality control and finishing processes here at New England Small Tube. The reason is stainless steel may oxidize if there are any traces of free iron on its surface. Traces of free iron may be embedded into the surface of stainless steel during the drawing process or while a part is being machined. If these particulates are not removed, then under certain conditions the stainless steel may oxidize and corrode. Passivation is a process that removes any of these trace elements of free iron. Parts go through a cleaning process, nitric acid bath, and deionized water baths. We provide complete coverage using ultrasonic cleaners. Our standard, NE-6021 D, exceeds the Federal specification QQ-P-35. 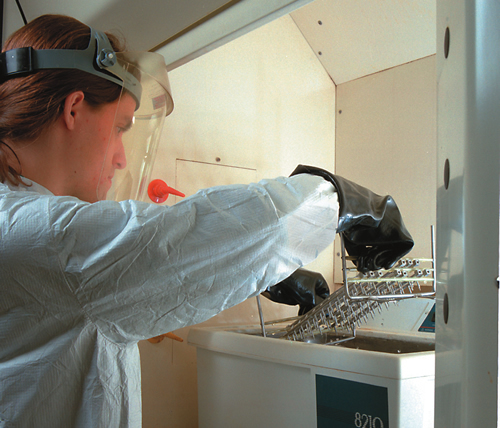 Our in-house passivation lab is the last stop for all our parts prior to shipping.